I have heard about being able to make alcohol in jail. How would that be done? I imagine the the ingredient list would be limited like thing that would only be found in a cell. Anybody have first hand experience? As far as utensils you have your hands, socks, toilet other basic supplies found in jail. An acquaintance of mine who did time claimed he used Five Alive to make jail brew. But then what can you believe from inmates! Prison brew generally does not taste all that great. 2 Puree the fruit. Combine the apple and orange chunks, plus the fruit cocktail and raisins, in a large saucepan. Use the immersion blender to puree the fruit until it’s juicy and pulpy, but still has some bite-sized chunks in it. •Make sure to move the immersion blender around in the bowl as you blend, to ensure the fruit is pureed evenly. 3 Boil the fruit, sugar, and water. When the fruit is ready, add the 1 cup (225 g) of sugar and 2 cups (474 ml) of the water and stir to combine. Put on the lid, transfer the fruit mixture to the stove, and bring it to a boil over medium heat, stirring frequently to prevent burning. •Once the fruit comes to a boil, let it simmer for 30 minutes to kill any bacteria that may be present. Continue stirring the mixture regularly. 4 Cool the fruit. After the fruit boils for 30 minutes, remove it from the heat and let it cool. You don’t want it completely cold, but slightly above room temperature to help the yeast flourish. As the fruit cools, continue stirring from time to time so it cools evenly. 5 Activate the yeast. Combine the yeast, the 1 cup of warm water, and the 3 teaspoons of sugar in a bowl. Set the bowl aside for five to 10 minutes to let it activate. •As the yeast comes to life, it will begin to froth and bubble in the bowl. 6 Add the yeast and transfer the mixture to the bag. Pour the yeast mixture over the fruit and stir to fully combine. Transfer the mixture to the plastic bag. Press out as much air as you can, then seal the bag. •It’s important to warm the fruit mixture because the yeast will die if it gets too cold. 7 Store the mixture somewhere warm and dark. Wrap the fruit mixture in a clean bath towel to help keep in the heat. Then place the towel on top of an electric heating pad turned to low temperature. Transfer the fruit, towel, and heating pad to a dark place, such as a closet. •If you don’t have an electric heating pad, fill a hot water bottle with warm water. Be sure to check on the water ever six to 12 hours, and add fresh warm water as necessary when the bottle starts to get cold. •The reason you have to keep the fruit mixture warm is so the yeast will stay alive to ferment the fruit and turn it to alcohol. 8 Burp the bag daily. As the yeast converts the sugars in the bag to alcohol and carbon dioxide, the bag will slowly fill up with gas. To prevent it from bursting, remove the bag from the towel once or twice a day and open the bag to release the gas and pressure. •Reseal the bag, wrap it back in the towel, and return it to its dark spot on the heating pad. •When the mixture stops bloating, it means the yeast has converted all the sugar to alcohol and carbon dioxide, meaning the pruno is ready. This will take about five days. 9 Strain the pruno. When the mixture has stopped bloating, it’s ready to strain. Place a cheesecloth-lined strainer over a bowl. Pour the fruit mixture into the strainer and let the juice drain down into the bowl. 10 Transfer to a bottle and chill before serving. Place the funnel inside the neck of a sterile glass jar or bottle. Pour the pruno into the bottle. Transfer the bottle to the fridge and allow it to chill for several hours or overnight. 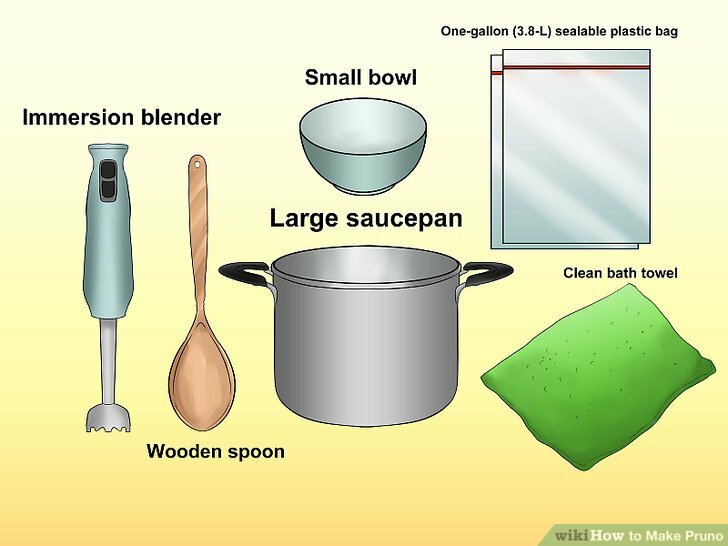 •A large mason jar will work to store your pruno, or a large two-liter pop bottle. Friends of mine worked for Aramco in Saudi Arabia. Of course there was not alcohol allowed, but the Americans lived in a separate community and the Saudi police turned a blind eye as long as they didn't catch you drunk in public. People got very creative about brewing up stuff from the grocery store. Apple juice and grape juice were easy to get. Baker's yeast and a large bucket and voila, you had apple cider. Then stick it in the freezer until frozen solid and then drain out the alcohol, then you have something about 30% alcohol. Yum! Not the answer you're looking for? Browse other questions tagged specialty-beers ingredients home-brew or ask your own question.